We've provided signs to thousands of organizations like yours, across the country and around the world . 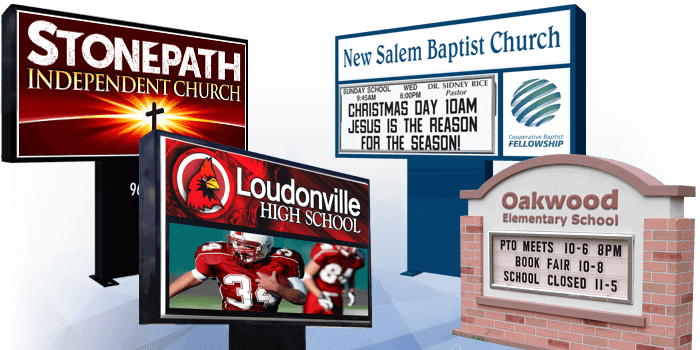 Increase attendance, grow membership, and promote programs and events with America's church sign company of choice. Communicate with parents, students, teachers and the greater local community. We're the country's top school sign company! Advertise your products and services, attract new customers and generate revenue with an eye-catching sign that pays for itself. Local governments use our signs to identify themselves and address the community. We hold GSA and CMAS contracts. We are a leader in providing high quality signs to civic organizations, and we are a licensed provider for the American Legion and the VFW. The company of choice for bases and federal installations worldwide. We proudly serve all branches of the U.S. Military. We design and build our own complete sign solutions and provide them through the easiest process in the industry. Our digital displays offer your organization state-of-the-art sign technology combined with the highest level of quality and service. Project a dynamic presence into the community! Our changeable letter signs allow you to effectively communicate with all who pass by. Easily and safely change letters with our Glide & Lock© support system. When graphic appeal and boosting awareness are your focus, these signs are the solution. Identify your organization, enhance your grounds and become a source of civic pride. Bring large-scale video capabilities to your events with a state-of-the-art LED video wall. Turn any wall into a dynamic centerpiece and take your organization to the next level! Create a masonry-inspired look that complements more traditional architecture. Made from modern, durable materials, these signs provide a classic appearance. Because our products are built to exacting standards with quality components, we can offer you some of the best warranties in the business! All of our electric products are FCC Compliant, UL Listed and UL Energy Verified. Striking designs that will enhance your image. Our in-house artists create some of the most stunning and eye-catching designs available on signs today. Our experienced and talented professionals will work with you to create a sign face that will leave a lasting impression! What our successful clients are saying. You made the process extremely easy and stress free. The sign is beautiful and is just what we were looking for. Bradford Baptist Church now has a new way to reach out to our community to let them know that we care and to invite them in for worship and fellowship. My sales rep was excellent. Very knowledgable, personable, and easy to get a hold of. Beautiful signs to get your message out to the world.